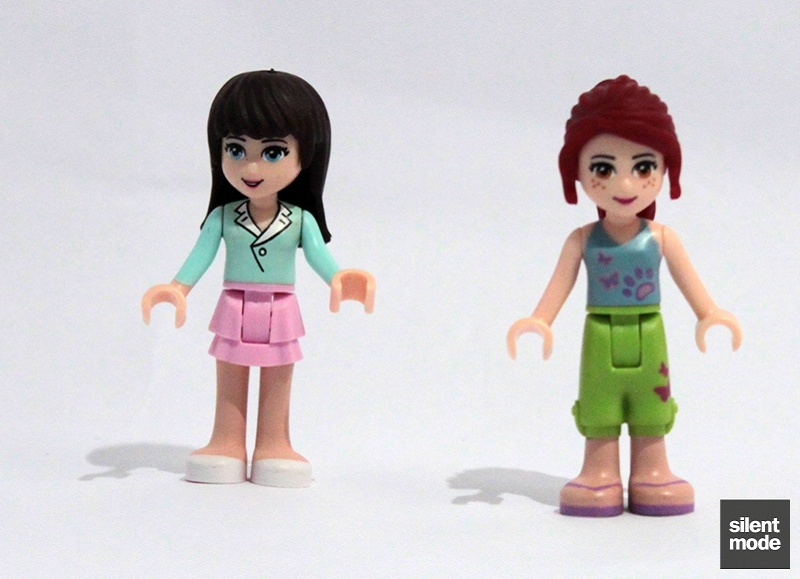 This is SilentMode with the second Lego Friends set review. It turns out there are at least 14 sets in this first wave, and some of the sets I’ve planned on reviewing have already been by other people. For the time being let’s look at today’s selection, which is one of the more expensive sets in the line-up. Both of the smaller reviewed sets have received a welcome reception, but how will something more pricey fare? 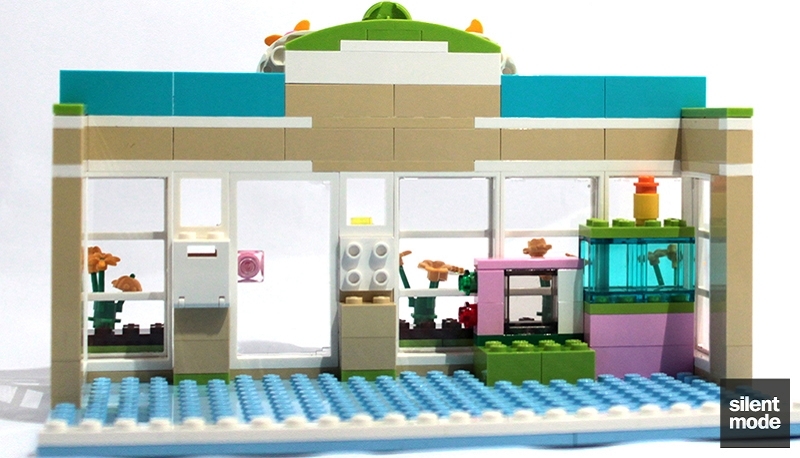 The second largest of the current Friends sets. I have a soft spot for hospitals, as even though I haven’t owned a hospital-themed set, I remember playing Theme Hospital with its awesome soundtrack. This particular set, however, is for animals. We’ve already seen Olivia’s dedication to animals in the last set, so let’s see what this one has to offer. 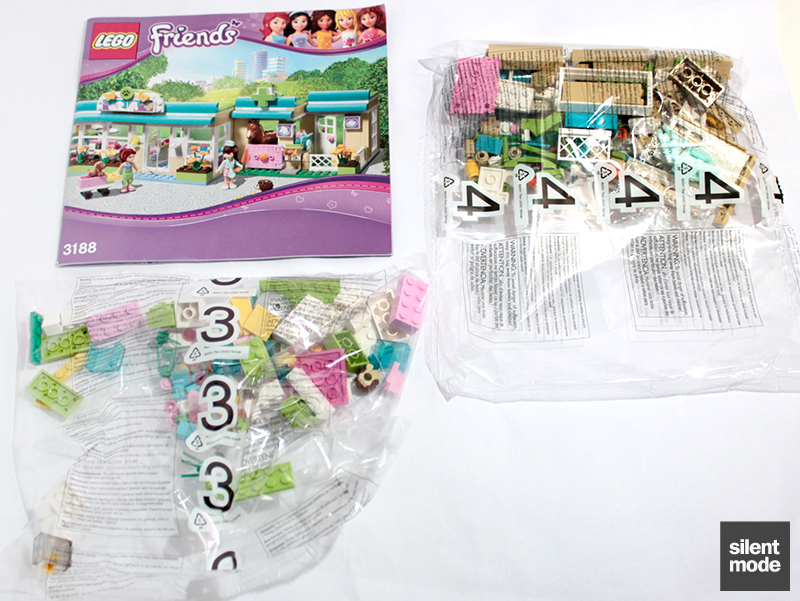 As with the other Friends sets, there is no part count anywhere on the box. 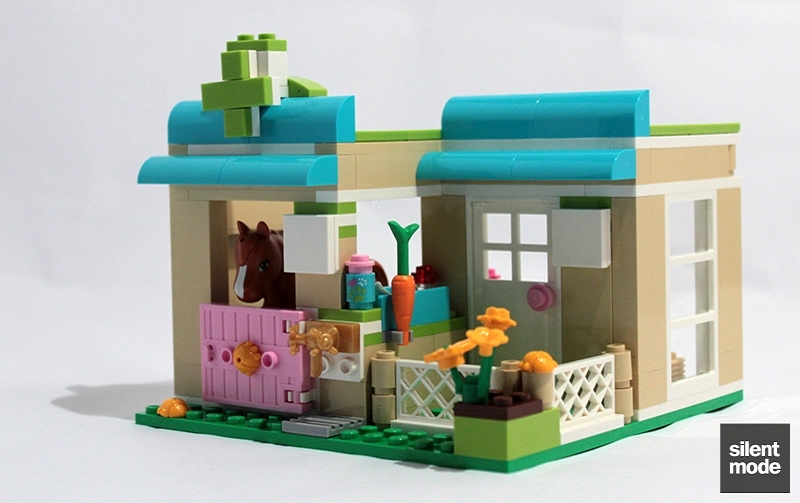 At the time of writing there’s also no part count on Brickset, but you can find out by looking in the LEGO catalog or on the S@H web site. Don’t bother manually counting; you’ll always be wrong. But seriously: if this is by design, it would be interesting to know what was behind the decision and what difference it makes. 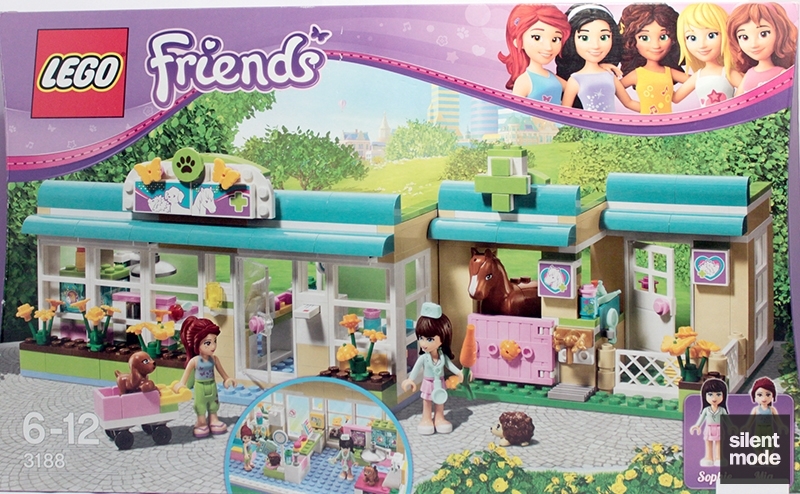 Again showing the play features of the set, this time Mia the redhead is revealed to be the featured Friends member. We also have a glimpse of some new animals, including the Friends horse, and some rather unusual accessories. This is what we’d hope to have by the end of this build, from the back. There’s a very real danger of the horse wandering into the main building, but as long as that cart is in the way the customers should be safe. 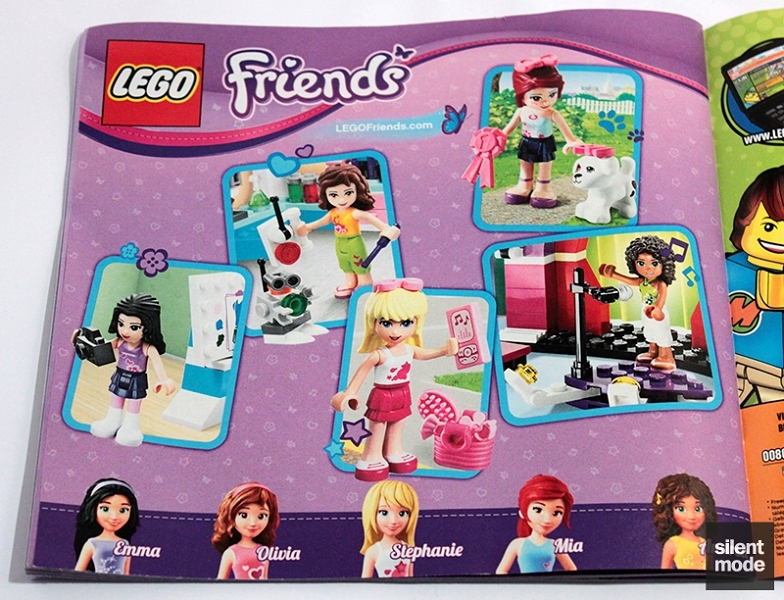 One of the long sides of the box shows the scale and appearance of the featured Friends figure. The other sides have the usual warning about choking on small parts, and small pictures of the completed set. 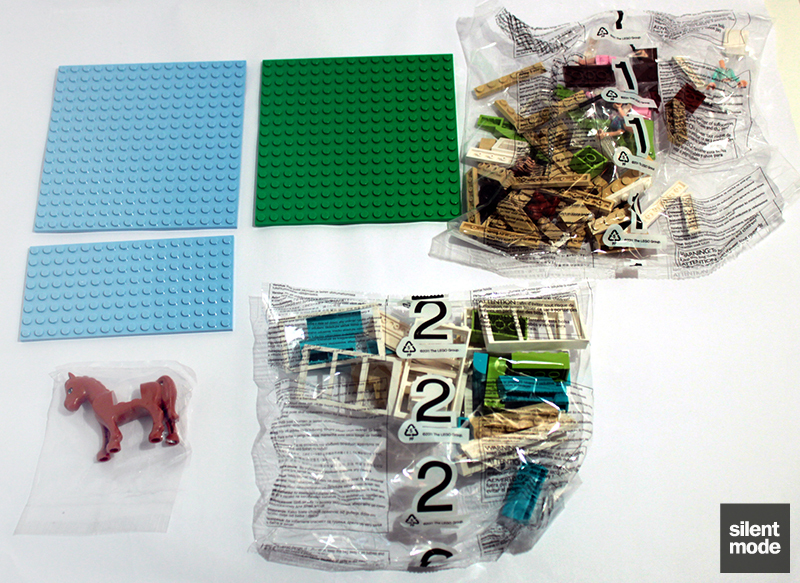 The first half of the contents includes bags #1 and #2, which both have fairly large bricks and parts, but also have a lot of space in them. Perhaps the extra space also serves as padding for when the box is transported? We also have a very useful 16×16 plate in Bright Green, and an 8×16 and 16×16 plate in the new Bright Light Blue colour. Already we have a reason to purchase this set – the two Bright Light Blue plates are exclusive to this and another Friends set (the café). Included in the above picture is the individually-wrapped Friends horse, complete with evil side stare. More on the horse later. 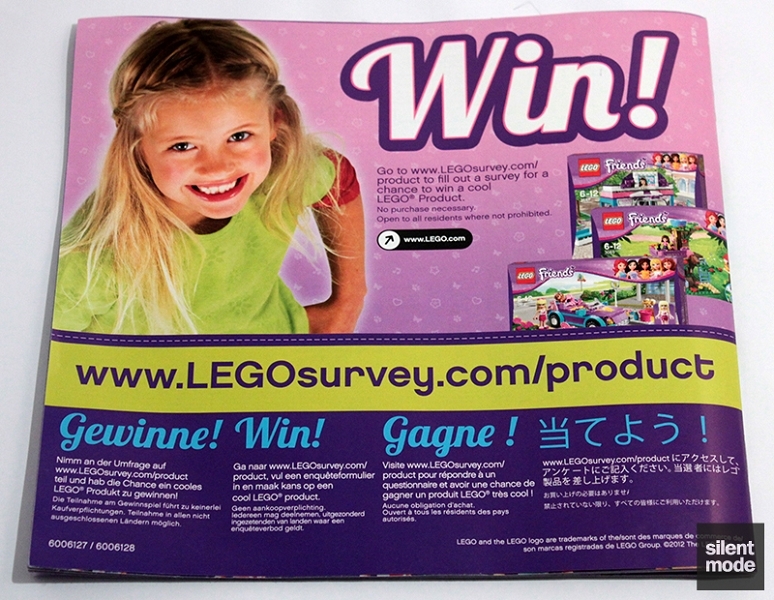 The second half of the contents includes bags #3 and #4, with smaller but more colourful parts, along with the instructions. Bag #3 contains the hedgehog. 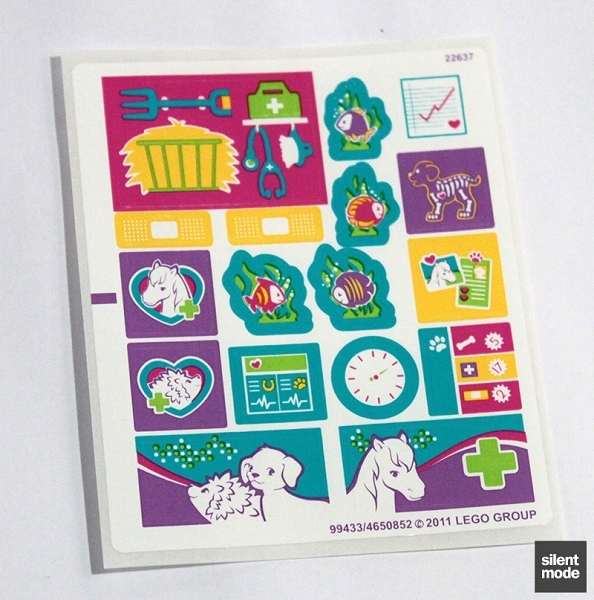 Tucked inside the instructions is this sticker sheet, full of designs inspired by the 2012 Olympics colour scheme. I don’t use sticker sheets when building sets anyway, but I’d be very concerned about using stickers in these colours on a model. Then again, maybe young girls like bright fluorescent stickers. The designs for these stickers also appear to have been inspired by manga! 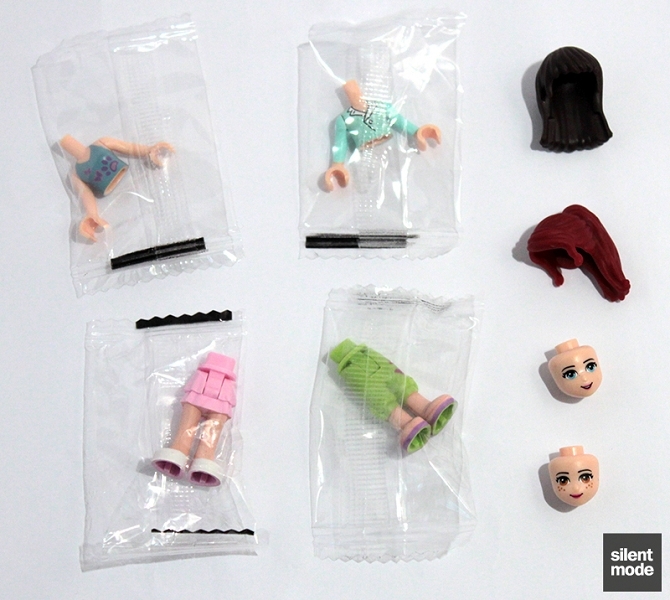 Not one but two Friends figures in this set, which means a small range of torsos, hairpieces and legs to interchange. There’s not much difference between the two heads: the only ones I can see are the eye colours and presence of freckles, and also that one has an open mouth. Without even looking at Mia’s official profile, I could tell she was either a vegetarian or vegan. Whether or not it has anything to do with being a redhead, whenever there’s a group of girls there’s always one vegetarian/vegan, it seems. Sophie (left) is a supporting character in this set: she runs the vet (which is suggested by her outfit), with occasional assistance from Mia. To be honest, she doesn’t look much like a veterinarian; she’s missing a white jacket (reference picture). As someone will invariably request: here I’ve switched the hairpieces between the two. All of a sudden we actually notice Sophie. In both cases Sophie is visibly older than Mia, which is strange given that they have the same proportions. Initialy I thought it had something to do with the face, but it seems to be the hairstyles – Sophie looks younger in this picture than the previous one, while Mia has gained a few years. 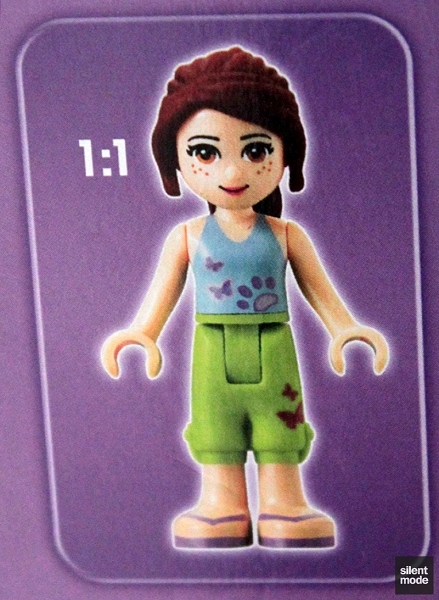 Mia’s hairpiece on our generic female minifigure, whose name is now officially Angineryka. 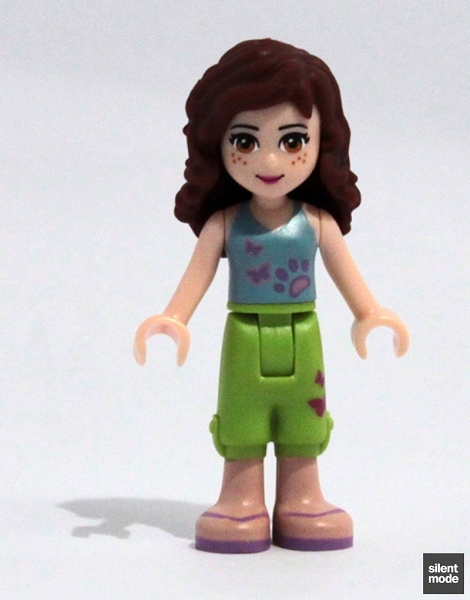 Note, in a clever moment of inspiration, how I’ve given Sophie the minifigure equivalent of the hairpiece – proof that compatability goes both ways. 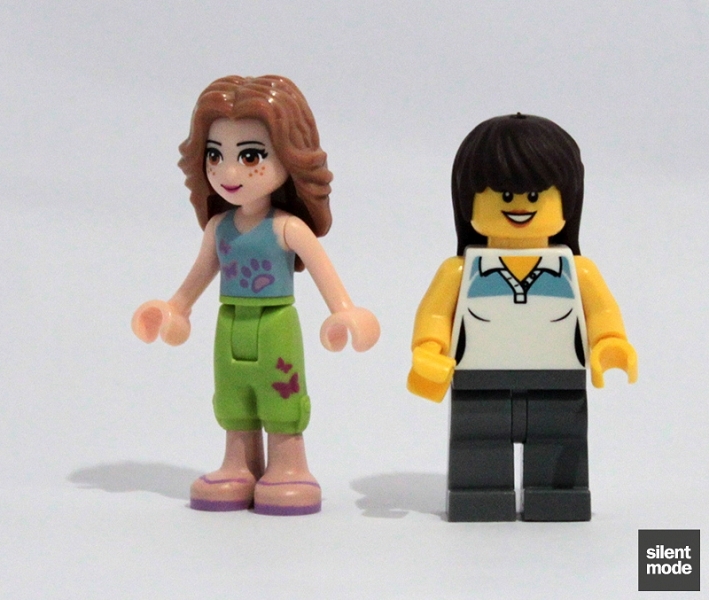 I think the minifigure version looks better than the rubbery Friends one on both figures. 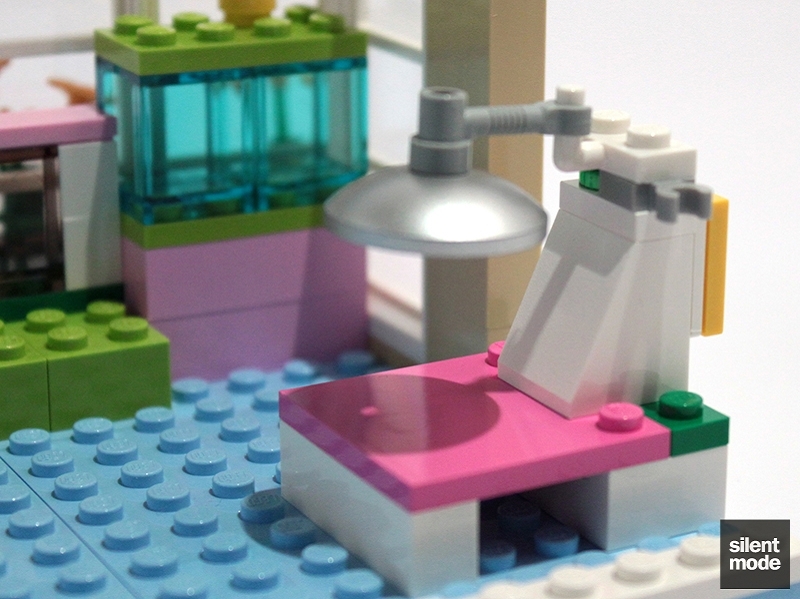 While Mia is trying on the S2 Pop Star’s hairpiece, Sophie’s hairpiece turns Angineryka into a Monica Lewinsky minifigure – for the genuine article use it in conjuction with the S1 Cheerleader’s head. I don’t particularly like this Monica hairpiece, simply because it adds age and width to both a Friends figure and minifigure head. It does give off a 60s vibe, however, and it might be useful for that purpose. Finally, Mia tries on Olivia’s hair. If you don’t like the hairstyles of any of the Friends characters, you can always change them. For now I think they’re fine with the hairstyles they come with. 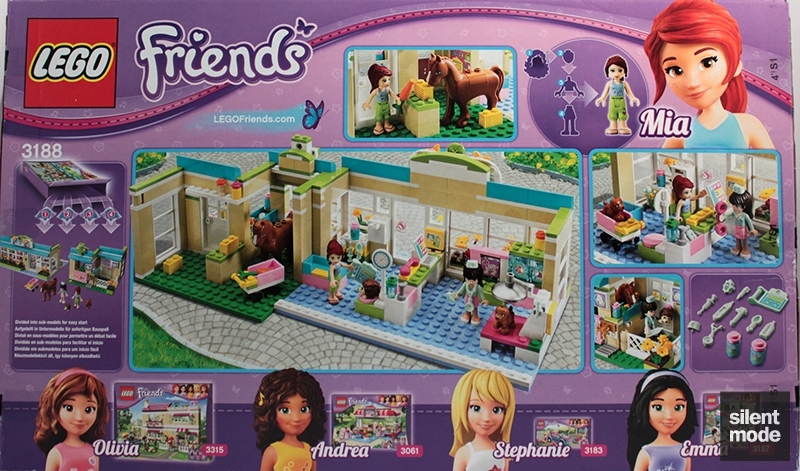 The set introduces three new animals, all designed for the Friends theme. Most anticipated was the hedgehog, which is officially in Tan with brown paint on the body. I’m not really sure why it was so anticipated, as I think it just looks okay, but it’s an unusual choice of animal given that we’ve seen so many dogs and cats in other sets. It is able to sit on two studs, so you can place it on a large plate with no problems. More importantly, this is currently the only set you can find the hedgehog in. 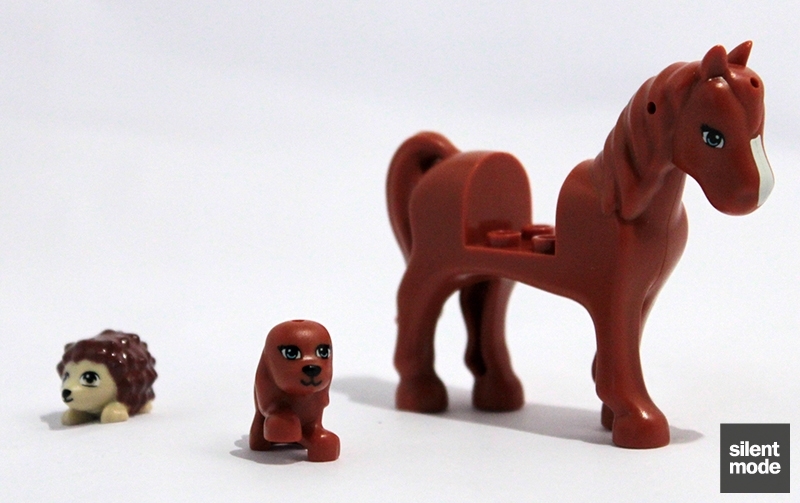 Both the puppy and the horse are in BrickLink’s Dark Orange. The puppy also sits on two studs, and while it looks far too cutesy for my tastes, it’s a big improvement on the Tree House’s kitten. 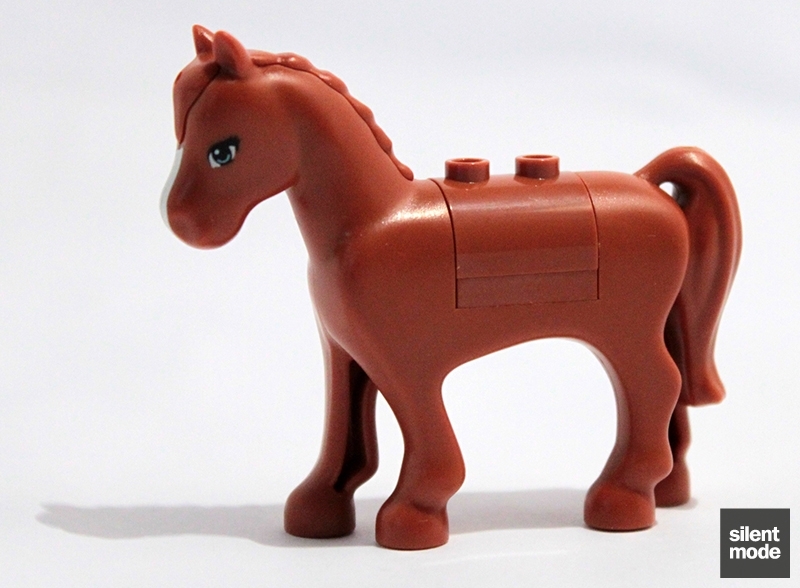 The horse is a much smoother and more realistic design than the minifigure horse, and while I’m not really fussed about horses I think it looks good. 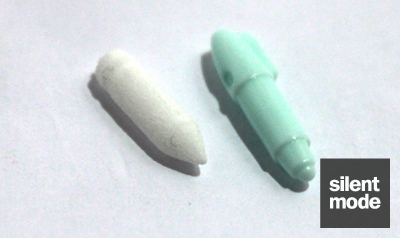 Although the shape of the mould is generic, the eyelashes suggest that this particular horse is female. We’re given a curved brick and a 2×2 plate – both in Dark Orange – to fill the 2×2 chunk taken out of her in the packet. 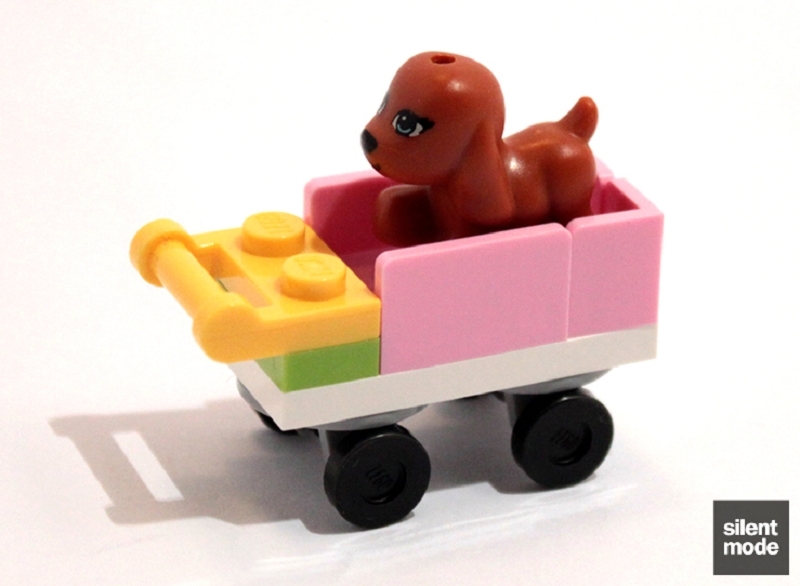 …or you can give your animal friends a ride. 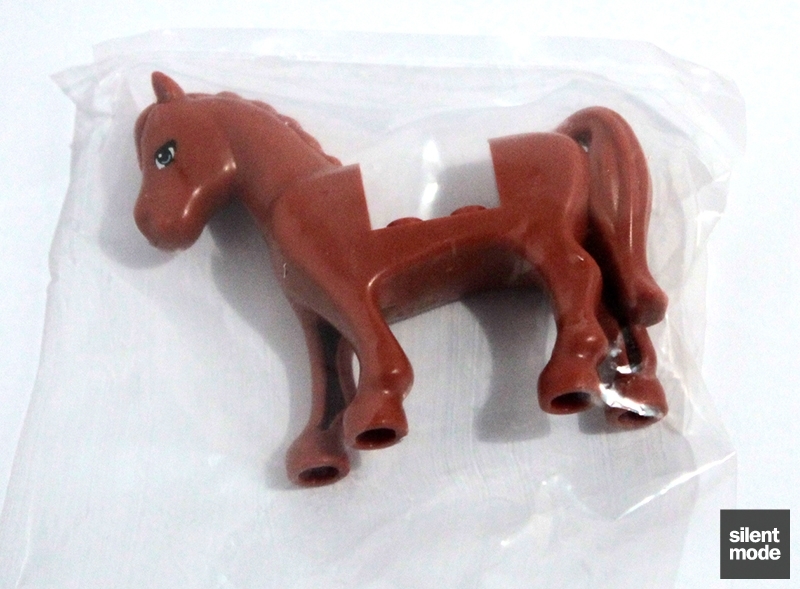 One important thing to note here is that, unlike minifigure horses, the Friends horse is in one piece – so there’s no bending of the neck. 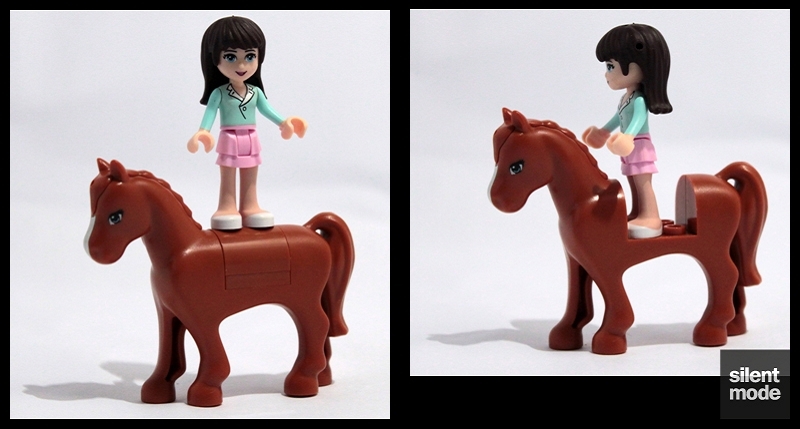 If it wasn’t for this limitation the Friends horse would be perfect, but I still prefer it over the minifigure horse. I’d be very surprised if this horse didn’t appear in other sets in the future, perhaps in different colours. 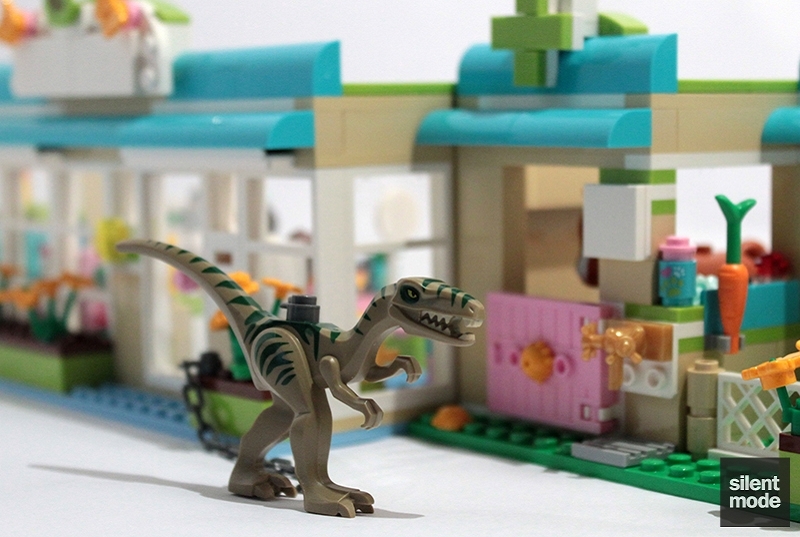 In addition to the Bright Light Blue and Medium Lavender seen in the Tree House set, we have one more that appears in this set: BrickLink calls it Medium Azure, and it’s visibly lighter than Alien Conquest’s Dark Azure, which was introduced last year. Particularly if you were into Alien Conquest, Medium Azure could be a very useful colour in the future, since Dark Azure mostly appeared as minifigure parts. The S6 Surgeon’s torso and legs are also Medium Azure. The two Medium Azure round bricks have some kind of animal print on them, possibly representing pet food. This would be an odd choice of colour for a food container; I’d suspect it’s for some kind of powder to make animals smell fresh. Here’s the first introduction to Friends accessories: little bits you can add to the figures and even the animals to make them more appealing. 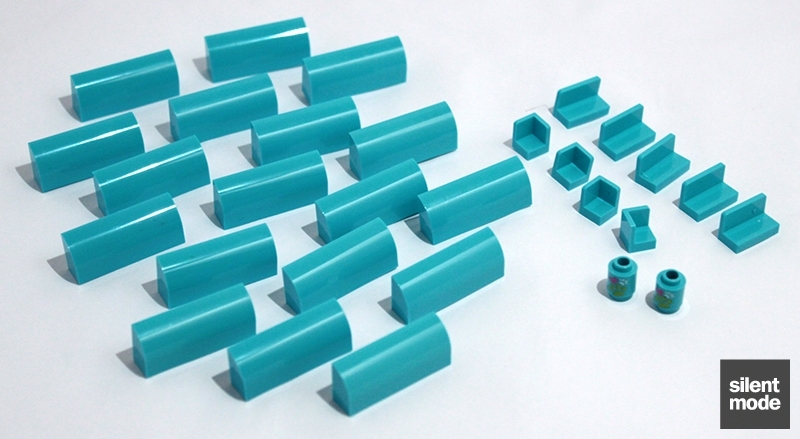 BrickLink has decided on Light Aqua for the colour name. These are all counted as one part, as with the new flower parts. Here to model the accessories on a Friends figure is Sophie. 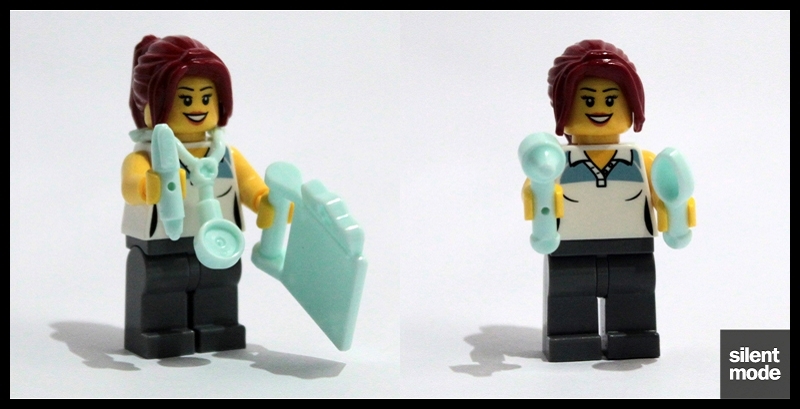 Unlike with minifigure body wear parts, the stethoscope can be applied without having to take off the head. One thing the Friends figure makes [widely] possible is the option of having a hairstyle with or without accessories, as is demonstrated. 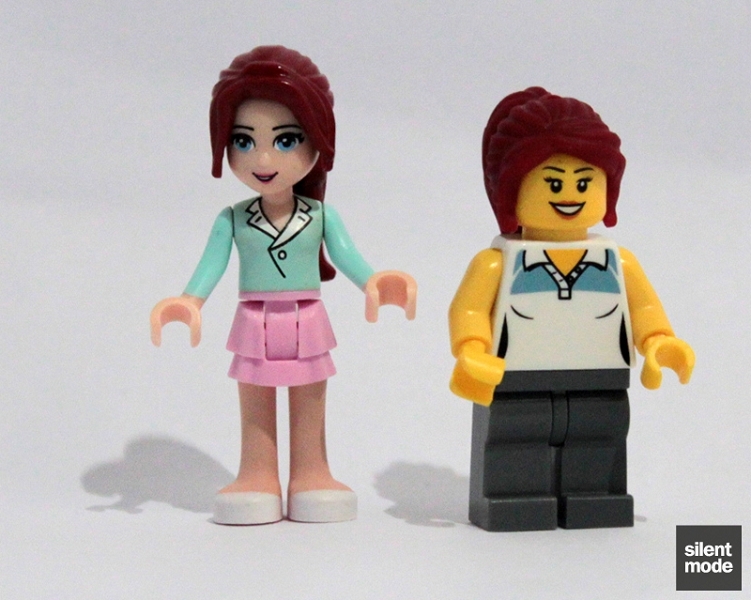 Given that Friends hairstyles can be worn by minifigures, this opens up new possibilities; there are currently only two minifigure hairstyles that allow the addition of hair accessories, and even then the only real option was the tiara. I’m sure this feature’s going to be popular with the target audience, because how many of them buy clothes and accessories for dolls (and perhaps even new dolls for their clothes and accessories)? 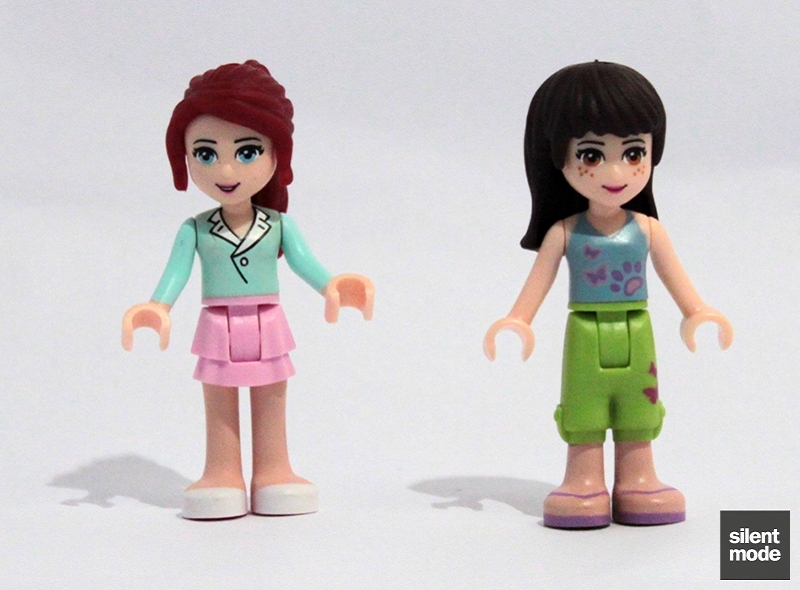 Angineryka shows how the Friends accessories can also be used by minifigures. Be warned that the handles seem to be slightly thicker than on other elements, but they do fit. 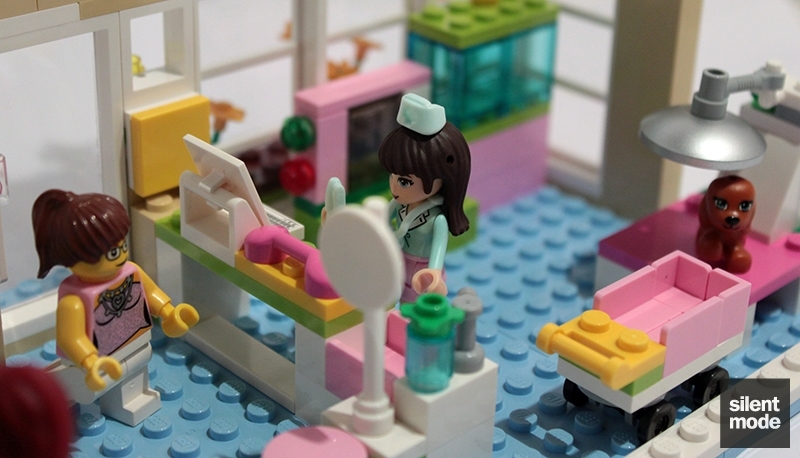 Most of the accessories, including the clipboard and nurse’s hat, are far more suited to Friends figures – but the ones pictured here go particularly well with minifigures. 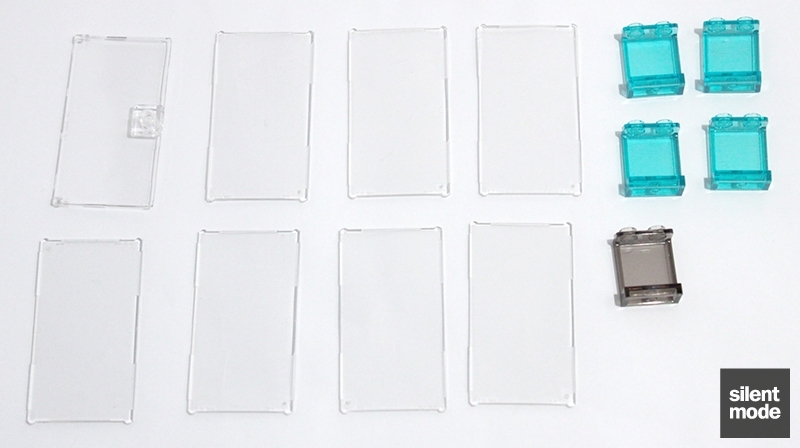 If you’re a fan of transparent parts, this picture might float your boat. We have no less than seven glass panes for door frames, and four of the Trans Light Blue panels (which appears to be a new variation for 2012, although it appears as an alternate part in the last police station). Lime features very prominently – I’m not a huge fan of Lime, but at least these are mainly 1×3 tiles. The rest are very useful for one’s other exploits, particular the White 2x4s. As with the Tree House, we’re greeted with some of the new flower parts in the Friends theme. This time they come in Bright Light Orange, which means there’s now a little variety – but most people I’d imagine would want red roses. My pick of the entire set, minus the large plates (which speak for themselves). Twelve 1×4 SNOT bricks in Tan. Seven glass panes. A metallic silver dish. But probably most impressive of all are some of the accessories on offer: these are just a sample of the official parts we were sorely missing. Having said that, most of this selection could be obtained from other sets, perhaps for less of an investment. While the animals will probably be the main focal point for most people looking at this set, I wouldn’t want more than one of each. The small build before the main event, similarly to the cat basket with the Tree House. 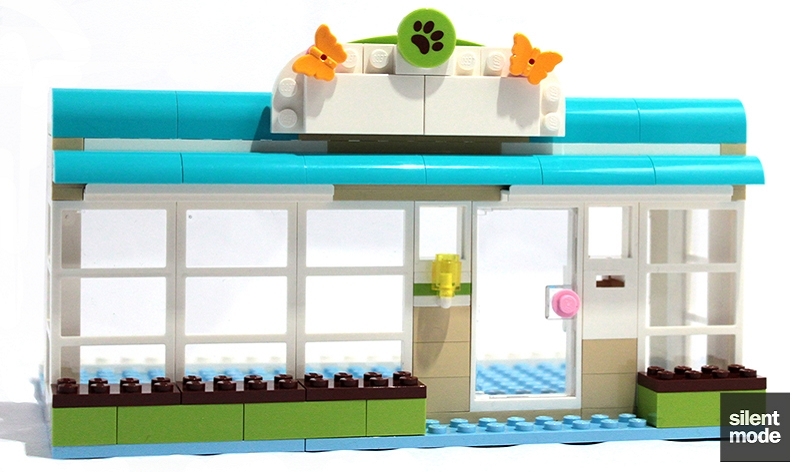 The design is reminiscent of Paradisa; there’s a similar build in set 6403 where it serves as a pram. This cart is used for transporting Mia’s puppy, but we also saw it being used earlier for serving the horse carrots. Simple but effective. The beginnings of the main building, focusing on the exterior. Those frames with the bars across them work very well as multi-paned windows; I would never have considered using those frames before now, but I think I’ll start doing so. This fish tank build is genius; I’m going to steal/adapt it for my own ends at some point. Normally one would apply some stickers to the outside of those blue panels, used to simulate the contents of the fish tank. There’s no way I’m going to do so, particularly with those colours. Instead it might be more impressive to somehow place a decal or sticker inside the tank. Inserted into the building, along with the fish tank, is an x-ray machine. Again a sticker would be placed on the transparent panel to indicate it’s an x-ray machine, but without it we can pretend it’s something technical. Another clever little machine, making use of a “space arm”, goes in the back corner of the building. I don’t know exactly what it does – perhaps it gives your favourite pets a secret blend of 13 herbs and spices? Rumour has it that a fryer is on its left, but because that’s where the building cuts off we’ll never know. Again, this machine can be anything you want it to be. The rest of bags #1 and #2 fill the room with a front desk, some more equipment (including some weighing scales), and a special bed for our stray hedgehog. 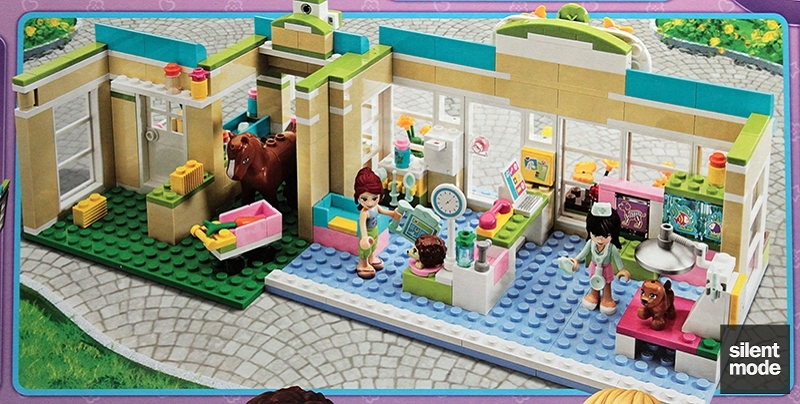 It certainly looks like the inside of a vet, albeit on a much smaller scale, and even with all the equipment it looks like there’s enough space for figures to move around. 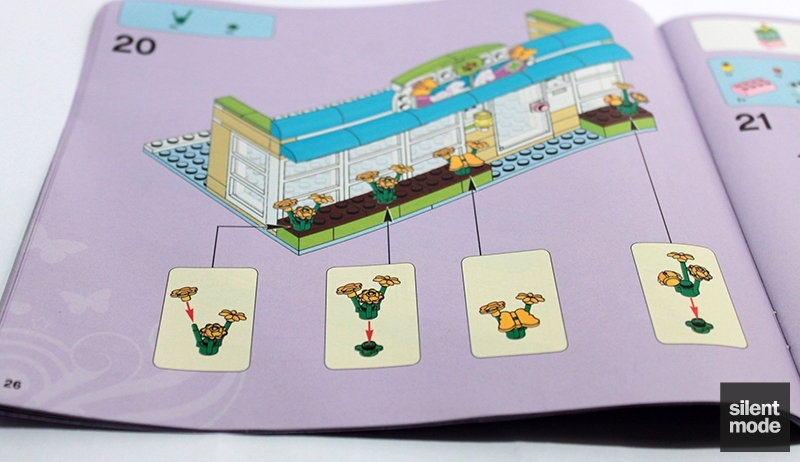 Similarly to the Tree House’s instructions, you’ll end up adding the new flower parts in different sections – yet they are grouped together in one step. The first time you’ll be presented with all 20 pieces, but only two butterflies are added. Basically this is an indicator to get these parts ready to add at any time. The second time, from out of nowhere, 12 more parts are added. At least in this set you can tell which parts to add and where. The second part of the building is home to the horse, who has been christened Ray Harryhorsey (even though it is officially female – I probably should have guessed from the pink stable door). This section can stand on its own, or be paired with the main building to create the “super-vet”. The back of the horse unit, where the horse hasn’t finished all its hay. Any ideas what that vial above the door is? Actually, I’m a little confused as to why there’s a door leading into a closed-off section. It looks like it’s meant to be a feeding area, but there’s barely enough room for the horse to face in that direction (hence the use of the 1x6x5 panel as a wall). Interestingly, the trough is where some of the accessories are stored, according to the instructions. Government funding is obviously no issue for Heartlake Vet: gold taps for horsey water. The two sections side by side, as pictured on the box. Put together it looks like a big building with room for expansion, but you’ll have to line them up carefully. I’m actually not a fan of the odd offset bewteen the two buildings. If they’re meant to be arranged side by side like this, I think they would have worked better as one big model, or at least have some way of connecting the two buildings to hold them in place. I’d assumed the latter would be the case from the box art. And here are Mia and Sophie outside the vet, with the puppy. It’s obvious that Mia is a volunteer at the vet, but is the puppy her pet or a patient? Hey, it’s your set; you decide. I’m going to assume it’s a patient she’s grown accustomed to. Not the kinds of extra parts I’d expected, but a surprise nonetheless. I’m not even sure I’m supposed to have that many round plates. There is actually one Green flower plate that was supposed to be here, but I’d misread step 20. There is also probably meant to be a Dark Pink one, but I must have lost it. 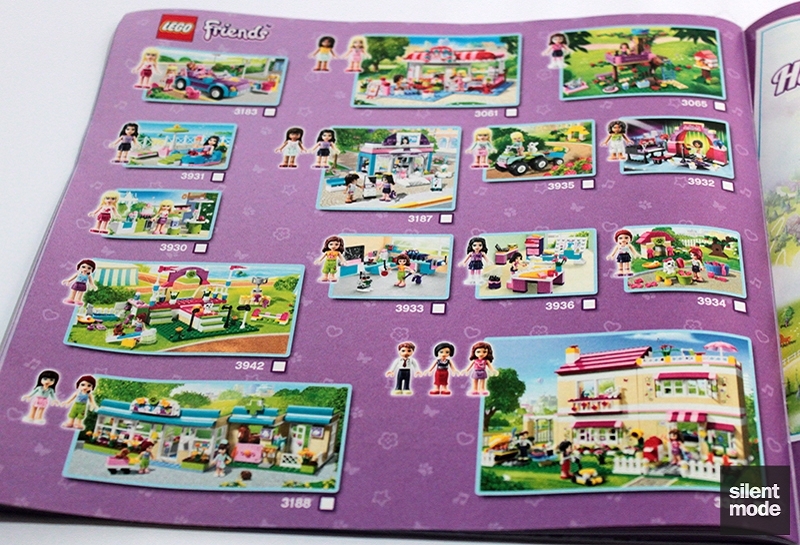 This page reveals there are at least 14 preliminary Friends sets, of which I have six (for reviewing and part collecting purposes, thank you). It also serves as a checklist, as well as a handy guide to the actual figures you’d get with each set. 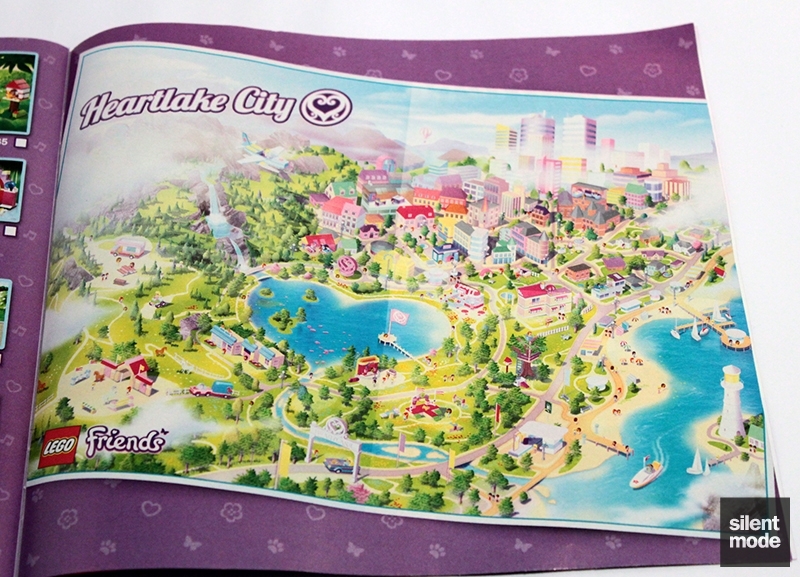 A map of Heartlake City: possibly a play on Salt Lake City, and the newest alumni of the Cringeworthy Saccharine Fictional Place Names Group, joining such legends as Sweet Valley High and Summer Bay. One wonders if some of the places depicted on this map will turn up as future Friends sets, if the theme does well. Possible areas include the lighthouse, the pier (or something to do with boats) and perhaps a school. One also wonders how many male figures will turn up in the theme, given that the city has a multitude of pink houses and heart-shaped features. Even the plane near the mountains looks a little… odd. The five members of the Friends, doing what they all like to do individually. Which is your favourite? Gewinne!th is back bigger than ever, having just gotten a promotion. Actually she’s roughly the same size as Gewinne!son on a similar-sized instruction book, but quite frankly I don’t know who’s more menacing. This was a very neat build, and it was quite surprising to see so few pieces go into such a large but detailed building. It’s very reminiscent of a doll’s house, especially because of the colour scheme, the basic equipment and the specialised figures, yet it has the charm of a Paradisa set – this is probably what we’d be seeing if that theme was around today. 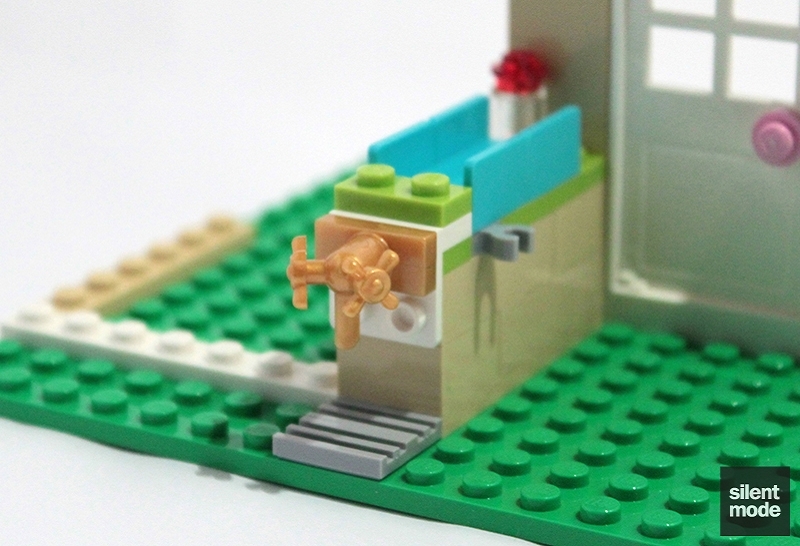 The selection of parts are the set’s greatest strength: there seems to be a mix of elements from different themes that go into making the building, and there are plenty of parts that could be put to use in MOCs and other areas. There’s that little hedgehog and the other animals to add to one’s collection, which depending on your taste for animals might find their way into minifigure worlds. Two Friends figures in the set is a bonus, but at this price point should be expected. But while the official figure-sized pen is very welcome, I’m concerned about how widely available it and some of the other accessories will be made. 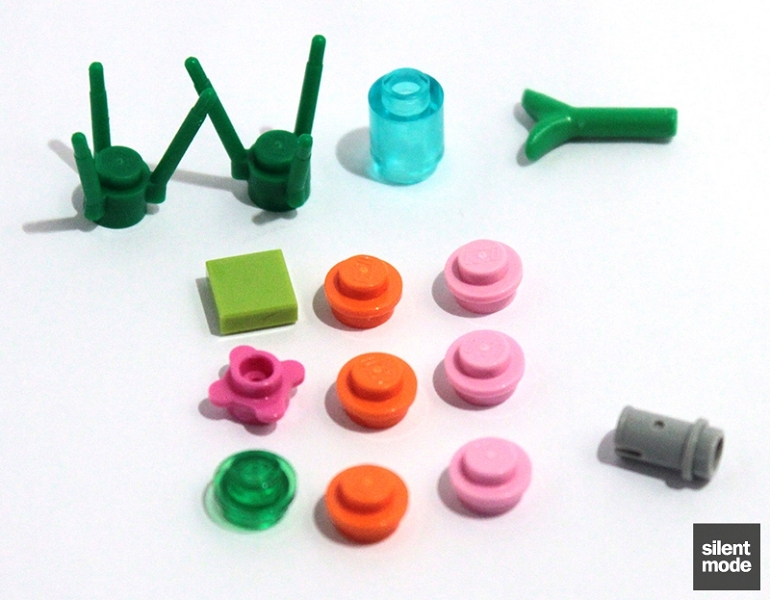 Apart from the issues with placing them while building the set, my worry was that the fact these accessories and flowers are all classed as one part respectively might limit the sets they’re included in, as well as their colours. It might not be possible to include the the pen, for example, without including all the other, medical-based accessories. I for one would like to see some of these new parts – especially the pen – in other colours, and in other themes, and in greater quantities. 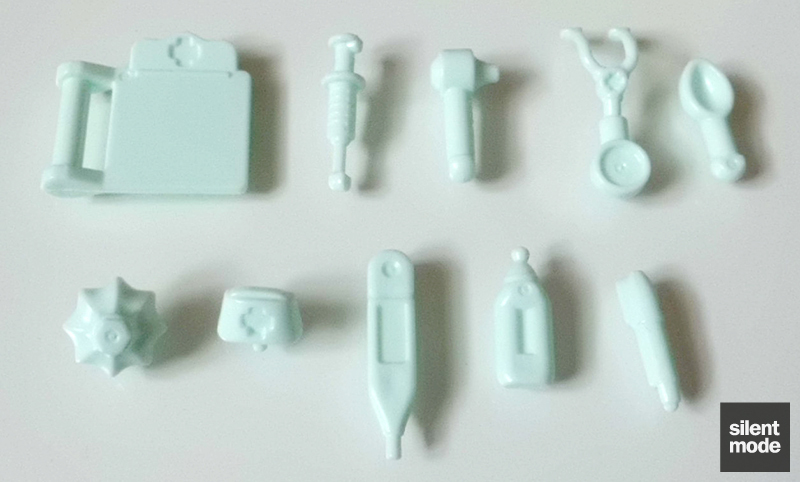 There is hope, however, in the fact that the syringe features on its own in the new Dino theme, as well as having been included with the S1 Nurse and the S6 Surgeon minifigures. Maybe the pack of accessories, like the tool and plume wheels, is what counts as one part. 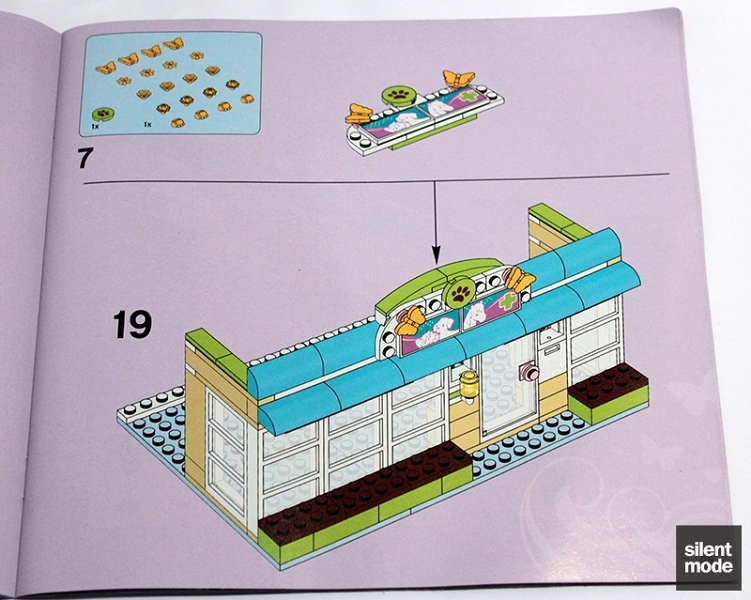 One thing that’s missing, given how the set is shown on the box, is a way to keep the two sections of building connected. 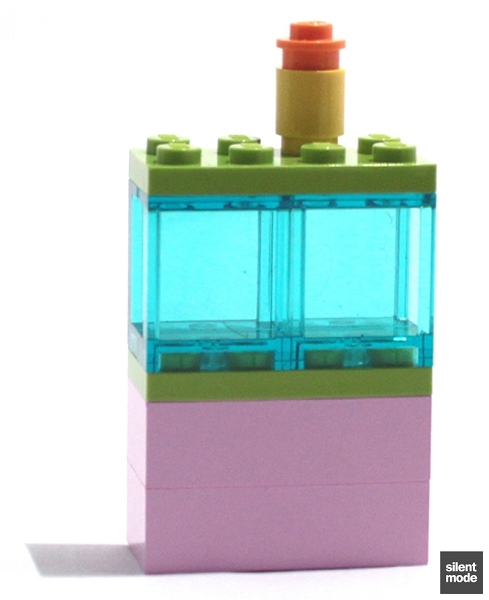 A simple connection with two Technic bricks and a pin would have done; it’s what they do with modular buildings, and there was certainly room for it in terms of part count and space. 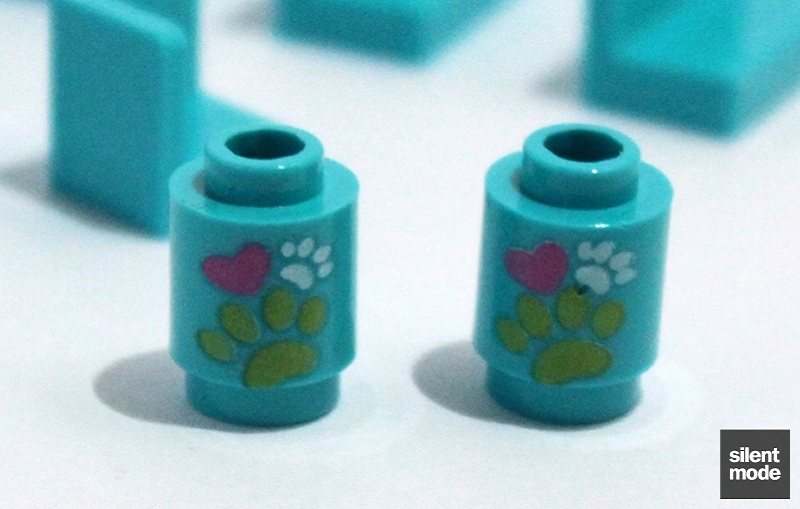 But apart from with the paw print sign on the main building, Technic parts haven’t really been used in the theme. A very good use of different shapes to create the building, particularly the curved bricks at the front. 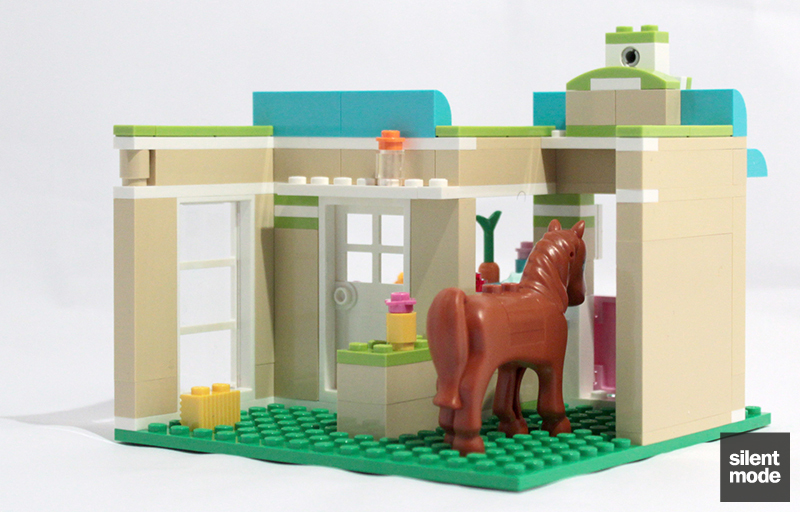 The inside of the main building isn't too cluttered, but a little more could have been done with the smaller (horsey) building's interior. Nothing difficult about the build; it was very interesting watching the progression of both sections of building, particularly as it's a clean design. 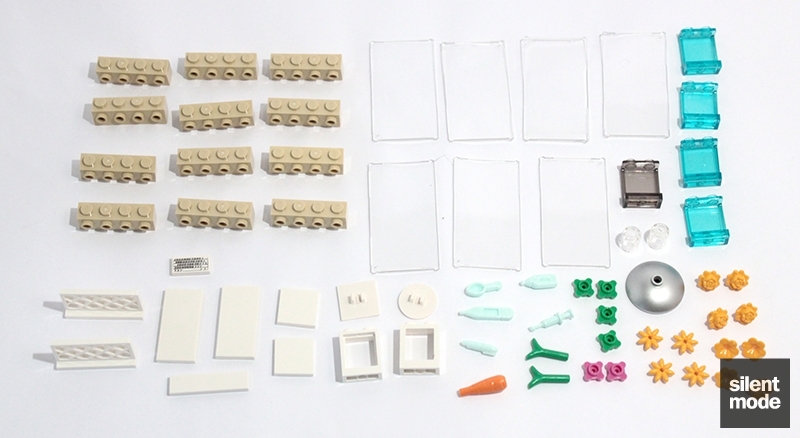 A good selection of parts to use in MOCs, but for that purpose there's not really anything (apart from the Medium Azure parts and the accessories) you can't get anywhere else. Perhaps not worth purchasing the whole set just for one or two specific parts. A "super-vet" or a small vet + stable: the choice is yours. The accessories, the machinery and the various containers of things give the figures plenty to do. I can't help thinking it's on the high side, particularly for less than 400 parts (even with new colours and moulds); GBP 29.99 would be a different story. Based on these scores, Heartlake Vet gets a 7.2/10. Watch out for in the sales. This is an urgent appeal on behalf of Henry the hedgehog. Henry was found in the park, curled up into a ball to keep warm, and surviving on a diet of grass and insects. In the summer months he’s even forced to drink water that falls from the sky. All that has changed, thanks to Heartlake Veterinarians. Heartlake Veterinarians gives animals like Henry the hedgehog a second chance at life, thanks to their state of the art facilities here in Heartlake City. Our team of trained, highly-paid volunteers give them the food they need to survive, such as our Friday special of foie gras sandwiches on a bed of royal vegetables, served with an animal-friendly Grey Poupon, complimented by our unique blend of Jersey cow milk and triple-filtered spring water. They make sure animals have clean, silk-lined bedding to sleep in, with their own private rooms individually air-conditioned and heat regulated, and have access to 1000 acres of private land, protected 24 hours a day by the best security in the country. But they can’t do this without your help. Please ensure the safety and well-being of Henry, and others like him, by giving just $2000 a month.